Christopher Tupa is writing a book! It’ll be a compilation of stories about playing with toys – the toys we grew up with, the toys we had as kids, and what it means to just have fun rather than obsessively accumulate and hoard a collection. It’ll be free (though you can donate to charity), and I think this is a rather great idea. So you know what? I’m going to submit some stories, too! The following one might not be my final draft, but maybe it’ll be a nice reminder of the days before we got uptight about Mattel, or had to spend a mint for an action figure, or were thirty years old. You can look at his project and help out HERE. 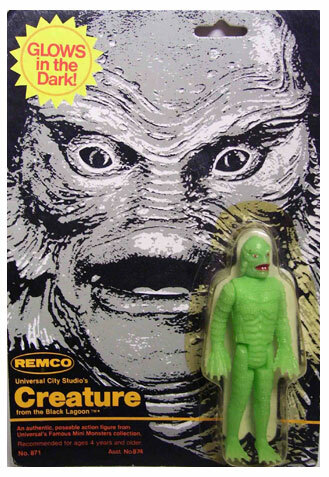 I remember pretty far back, and I know I had toys as a toddler or baby (I even remember most of my second birthday party, strangely enough), but the first toys that really stand out to me were two things: The old Remco glow-in-the-dark Creature from the Black Lagoon, and a pack of ten MUSCLEs on my fourth birthday. The Creature from the Black Lagoon began my love of fish-men and fish monsters in stone… but sadly, it has not survived to this day. My dad wanted to see how brightly he could make it glow, so he suspended it above a lamp. It fell in when we weren’t looking and mostly melted. Dad felt bad, and I got a replacement, but that one disappeared over the years, sadly. I bet if I brought this up to my Dad, he’d laugh about it. He’s awesome like that. But the MUSCLEs… the MUSCLEs are arguably what made me into the raving lunatic I am today! 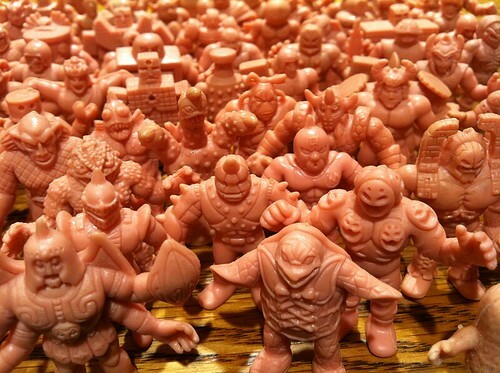 The pack had the claw guy, one of the MUSCLEman guys (the one with the army jacket), one of the sumos, the scissorhands guy, the little rock guy, the bike lock robot, the football player, the skinny guy with bug eyes, the guy with a bird on his head, and one of the six-armed guys. Six-armed dude got lost so early on that it took me years to remember precisely which one, but the others? They lasted. Sure, some disappeared over time (at last count, my survivors are Claw, Muscleman, Sumo, Scissors, Football, Lock, and Skinny). And man, I played with these toys a LOT. Yes, I know I lost some of them, but considering that I was a typical irresponsible little kid, a lot survived – to say nothing of the MUSCLEs I acquired later on, most of which are still in my possession. 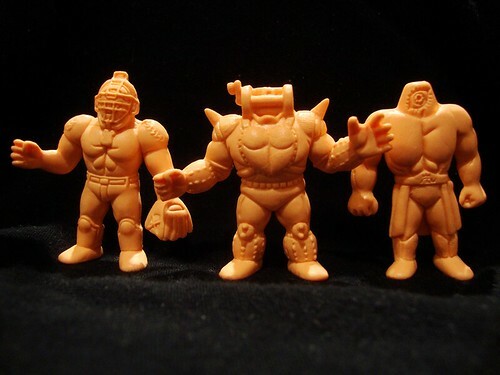 But man… see, nowadays I know about Kinnikuman, and the original characters these toys are based on, and I even own a ton of the original rubber Kinkeshi figures. Heck, I’e friended the two manga authors on Facebook! But back then, I had no idea who Kinnikuman, Sneagator, Big the Budo, Ashuraman, Iwao, or whatever were. So, the Claw was my favorite immediately (and as it turns out, he’s EVERYBODY’S favorite. The dude’s expensive now), and usually plays the good guy. or sometimes the bad guy because he was just like those Wallmasters from The Legend of Zelda. So sometimes I called him “The Floormaster.” Or sometimes, for reasons only a four-year-old can understand, I called him “The Shrimp.” The sumo guy was usually the bad guy, except for those times when he wasn’t. For reasons that only made sense back then, he also reminded me of shrimp. I think I used to like shrimp a lot. The Football guy threw exploding footballs (it took years to figure out what he was – he was anime-only, from a Kinnikuman movie. Those things were never translated, so he might as well still be a blank slate), the scissorhands guy (another movie dude. Turns out those were swords, not scissors) was a bad guy because of his face. Bird guy was Hermes, even though he didn’t have wings on his feet. Little rock guy was a trash bag. The bike lock robot was a numbers robot named “Calculus,” and I decided that he was evil because he was educational. The Muscleman dude became Jason Vorhees. The skinny guy was someone in mid-transformation from The Thing. Six-armed dude got lost too early to matter… though I got another one later without even realizing it! As I acquired more MUSCLEs (and a couple of bootlegs), I ended up totally loving the spinning brick top, the knights (all of ’em), and others. The big stone knight with three horns and wristblades became my absolute favorite, nicknamed “The Overlord.” He was the bad guy, you see. The next big sumo guy was… sumo. A cool sumo, but I didn’t call him a shrimp or anything. Maybe I was growing up? The cowboy was named “Buzzbee” for reasons that I cannot fathom. The lizard dude with the tongue became that similar monster from 20,000,000 Miles to Earth. And that really boring, plain dude with moobs and “Texas” written on his shirt? He was so boring that he was my least favorite. But you see, every show, movie, book, cartoon, or video game always makes the most boring character into the hero, and I was aware of this. If you looked cool, you were a bad guy or a sidekick. If you were Plainface McWhitebread, you were the hero. So Mr. Texas got to be the hero purely because I thought he was boring! And then you have the exocutioner, the six-armed dude (again! ), the knight with a crossbow (that’s totally cheating in a wrestling match), the other knight (“The Underlord,” said my oh-so creative self), and the ninja dude. As I grew up, my interests changed some, but MUSCLEs always stuck around. I got into Monster in My Pocket (and it introduced me to the wonders of mythology), but MUSCLEs still beat up the MIMPs! I had more Ninja Turtles toys than should be allowed, but MUSCLEs still bossed them around! 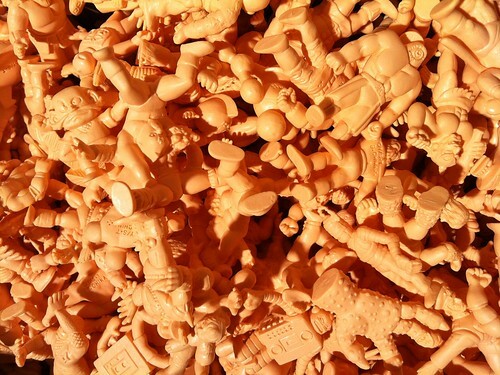 I collected Kenner’s Aliens and Predator toys… but they didn’t interact with MUSCLEs much. They lived in their own separate worlds. When I first learned about the internet, MUSCLEs were one of the things I looked up. And lo and behold… FAN SITES (only three of them. It was 1996, for crying out loud). CHECKLISTS. IMAGE GALLERIES. MYSTERIES. AND… AND PEOPLE! A COMMUNITY!!! Some of the friends I made in those days are still good friends even today (Hiya, Johnny!). 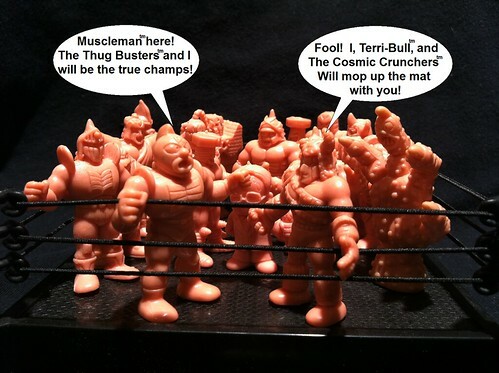 And after a while, I noticed that we had practically zero information on the original Japanese Kinnikuman series, so I took it upon myself to build the first english-language fan site ever! I totally botched it. I got nearly every detail wrong (I thought heroes were villains, villains were heroes, mixed up stories, and just totally screwed things over). But when I went to college, I handed the site to a friend who made it into a forum and collecting hub – look up Little Rubber Guys sometime, it’s still around and he and I are both still there. 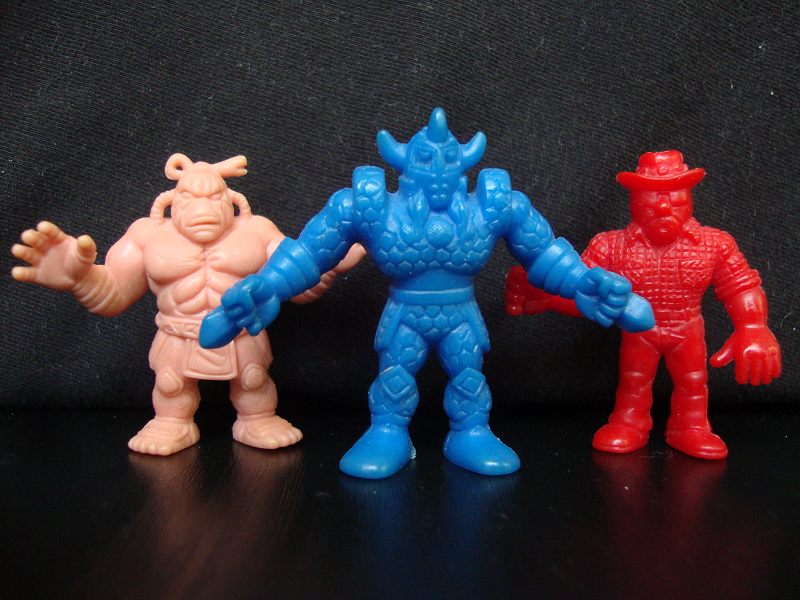 I’ve since completed a full set of MUSCLEs and then some, including the same sculpts and colors I had as a kid. I’m an old-timer in the hobby, and I collect and review and write about and photograph toys all the time. I’ve moved something like four times. I work as a teacher and editor. I have a Masters Degree. But you know what? I still like to take those old MUSCLEs out and make them wrestle. Complete with whoosh-whoosh noises. Great memories! I still have all my MUSCLE figures and recently saw a guy online that painted them. They were pretty neat. I had never thought of that growing up. Hi, I do believe this is an excellent website. I stumbledupon it 😉 I may return yet again since I bookmarked it.